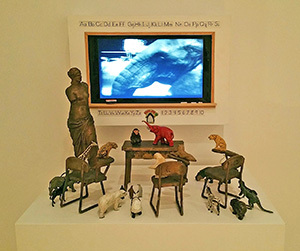 The Cazenovia College Art Gallery in Reisman Hall opens Thursday, October 20 with "Strange Nature," a group exhibition, this year showing the work of Stephen Brucker, Sarah Stonefoot Cross, Gail Hoffman, Tom Lundquist, and Ann Resnick. Artwork in the exhibition includes photography, sculpture, digital prints, and video installation. An Artists' Reception, free and open to the public, will be held on October 20, from 4 to 5:30 p.m. and will include lectures by the artists. The show runs through Tuesday, November 29, 2016. The Cazenovia College Art Gallery in Reisman Hall, 6 Sullivan St., is on the corner of Sullivan and Seminary streets, one block north of Route 20, in Cazenovia. Hours during the academic year are: Monday through Thursday, 1-4 p.m. and 7-9 p.m.; Friday, 1-4 p.m.; and Saturday and Sunday, 2-6 p.m. Summer hours vary. All exhibitions are free and open to the public. For additional event details, contact Jen Pepper, gallery director, at jpepper@cazenovia.edu. Stephen Brucker is a glass artist who lives and operates his studio in Camillus, New York. In addition, Stephen is a Flameworking instructor at the Studio of the Corning Museum of Glass. Born in 1967, Brucker received his M.F.A. in 2012 from the Rochester Institute of Technology in Sculpture with a minor in Glass Sculpture while studying under the direction of artists Eun-Suh Choi and Michael Rogers. Prior to this he earned his B. F. A. in Sculpture from S.U.N.Y. Oswego (2005) while studying with artist Kathy Budd. He has been awarded various grants and scholarships which include the Scholarly and Creative Activities Grant, the Robert M. Sullins Award and the Aulus Saunders Award. Brucker's borosilicate glass sculptures are centered on the expression of form and structure found in nature. Fragility, transparency and impermanence are core conceptual topics that Brucker explores in each of his sculptures. He is most interested in representing these natural forms and structures in the most economical way possible while pushing the physical properties of the material to its limits. Palingenesia Trio explores metempsychosis: the transmigration at death of the soul into a new body of the same or a different species. This investigation began by considering the natural forces that shape wood. Nourished by water, this material goes through a cyclical journey, from seed, maturation, and decay. 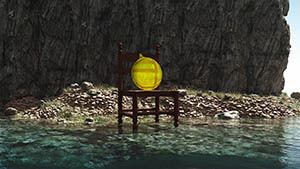 Water is a critical agent in the process of decomposition that produces new forms. As I considered this metamorphosis I began to question the migration of life forces that inhabit this material. Palingenesia Trio describes the beginning of the Spirit's voyage. The work shows this journey in time, between the present and the future. 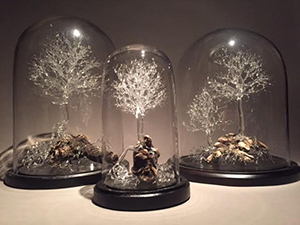 The tree forms that result from the manipulation of borosilicate glass present the qualities of transparency, fragility and impermanence, key concepts in this exploration. ​​ Sarah Stonefoot Cross assistant professor and director of photography, joined Cazenovia College in 2013. She previously taught as a visiting assistant professor in photography & new media at Beloit College in Wisconsin from 2008 to 2013. She received a BFA from the University of Buffalo and an MFA from Illinois State University. Her work has been shown nationally in both group and show solos at galleries including the Catherine Edelman Gallery, Wakeley Galleries, Silver Eye Center for Photography, the Center for Fine Art Photography and the Black Box Gallery. The botanical objects I have brought into the home are stopped in transformation. Their location is often questionable and their capacity for self-motivation is ambiguous. Fluent in a secret language that’s rich in mythic rawness, they crawl, branch, sprout and mimic their surroundings. Domesticated and anthropomorphized, leaves and seeds obtain a poetic vitality through their relationship to the home - a space that welcomes imaginative rediscovery. Given my desire to experience nature firsthand, I prepare for each photograph with a sensory exploration. It is only after I have altered the botanical material, pulled it apart and stripped leaves from its stem that I can find in nature something new, something different and something unexpected. As Pierre Mabille notes in "The Mirror of the Marvelous," "Alice's adventures in the rabbit burrow or through the mantelpiece mirror encourage us to search for other gaps where we can penetrate the marvelous." Like Alice, I'm hoping to find my portal into reverie. We shelter ourselves both with and from nature but we are still part of its world. Within the home sunlight serves as a constant reminder of nature's transience. Its luminous, shimmering and prismatic effects readily trigger the thoughts and daydreams of quiet rooms. The home is an unbounded interior; within its walls one's mind can drift and worlds can arise. Leaves, seeds and buds I use become swarms and armies descending upon furniture. They respond to and are altered by the home’s architecture and its resident. Reclaiming their space, the natural objects remind the furniture of the life it once held. With newly acquired botanical inhabitants the home transforms into a landscape. Curtains are large open skies and the seat of a chair is an open field. These invitations to reverie are most welcome in the space of the photograph - an ideal place for the construction of new worlds. Gail Hoffman was born in Hempstead, New York. She received a BA with honors in fine arts from Dickinson College in Carlisle, PA., and an MFA in printmaking from Indiana University. She teaches narrative design, animation and video in the Transmedia department at Syracuse University. Her first solo show was at the Chuck Levitan Gallery in Soho in 1998. She has shown at the Denise BibroSOHO20 Chelsea Gallery since 2001. 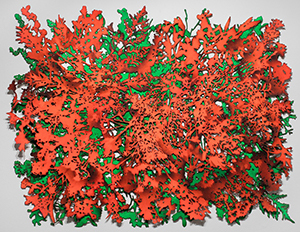 She shows regionally and nationally, recently winning first prize in the "2014 Made in New York Show" at the Schweinfurth Memorial Art Center in Auburn, New York. As part of a series of ongoing community initiatives in Syracuse, she became the Everson Museum of Art’s first "Artist in Your Neighborhood" where she showed her mini video installations in the museum's education gallery. In another Syracuse community outreach project of 2013, she was a visiting artist at Henninger High School working with high school design students and ArtRage Gallery in conjunction with its exhibition, "Significant Souls." She had a three-week residency at Stiwdio Maelor in Corris, Wales in 2015 where she worked on her collaborative animation project, "Community Theater." Continuing with visual metaphorical narratives, I’m combining video and sculpture with the theme of crossing boundaries. Cast bronze mini installations paired with collaged film/animation explore the challenge of remaining centered amidst transition and transformation. In one of my most recent works, "Diving Pool", a small cast bronze girl is poised on the edge of a diving board. Video streaming through the blue glass pool appears projected from below. Her focused concentration and stillness of her pose is in sharp contrast with the continually moving images in the water. 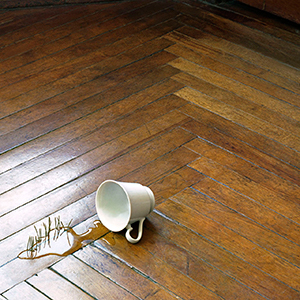 Tom Lundquist was born in 1950 in Minneapolis, Minnesota. He graduated from California State University Northridge in 1972 and is still at large. Trained as a printmaker, Ann Resnick has engaged a broad range of materials and processes, from wood burning to digital signal processing, and uses that range to produce large-scale, thought-provoking, sui generis works. Beyond that however, Ann Resnick is a cultural advocate, and dedicates a large portion of her time each year to activities that advance the arts as a whole. Alongside a 20-year history of exhibitions, she has operated Project gallery out of an abandoned warehouse in Wichita, Kansas, showcasing the work of artists from around the country as well as the work of local artists. We’re too preoccupied, most of the time, to notice the beauty of grief. It pours out of us, in flowers and hymns and memorials and tears, but these are in-the-moment reactions; not fully formed, not truly cathartic. There is an on rush of unexpected emotions and assumed responsibilities. Relations are suddenly rearranged-and then we go on. And the moment is lost or drags on or mellows into the sweet ache of loss, and maybe we adapt and maybe we don't, but it’s something we live with every day for the rest of our life. We never step back to appreciate the feeling.